12-na is a creative platform designed in 2004 by textile artists Mariano Breccia and Mechi Martinez, an Argentine couple based in Chile. 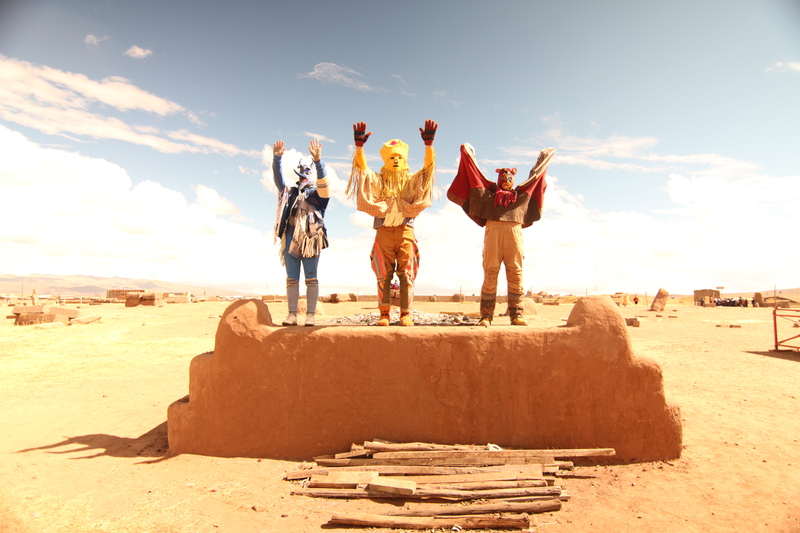 Breccia and Martinez work in diverse formats ranging from costume design to installations, films, workshops, and interventions on public streets. Their complex body of work uses recycling as a means of expression, raising questions about sustainability and the experience of dressing and eating in more conscious ways. For Breccia and Martinez, remaking a garment involves more than assembling a collage of fabrics; it requires the ability to design a garment that meets the same expectations of a new piece of clothing created by a designer, including high quality, a good finish, and the ingredient of creativity. The couple found inspiration for their 2012 collection, “Kusiclos y el Cóndor,” from Bolivian mythological characters called kusillos. To create the collection, Breccia and Martinez traveled to La Paz, where they filmed a fashion piece based on a contemporary interpretation of the kusillos, using the look and design of 12-na . 1 The characters—some of them half bicycle, half cyclist—generate change and awareness, raising in a new context the possibility of the body as a legitimate means of transportation (SEE FIGURE 1). From the Kusiclos Collection, Bolivia. Collaboration is another important aspect of Breccia and Martinez’s practice. In YOMONSTRO, “monster” masks and costumes are created in interactive workshops from recycled materials, creating a vehicle for people to explore and expand the boundaries of the self and reveal their complete identity in a social environment. 2 This process, termed demonsterate, from “monster” and “demonstrate,” serves as a creative action that is open to the integration of polarities—one that does not attempt to separate or divide what is from what is not, good from bad, or beautiful from ugly, but simply to explore and recognize the contradictions that dwell within each of us. YOMONSTRO operates as a collective experiment involving artists from other areas, with 70 artists from four countries—Argentina, Chile, Germany, and Brazil—currently “demonsterating” (SEE FIGURE 2). 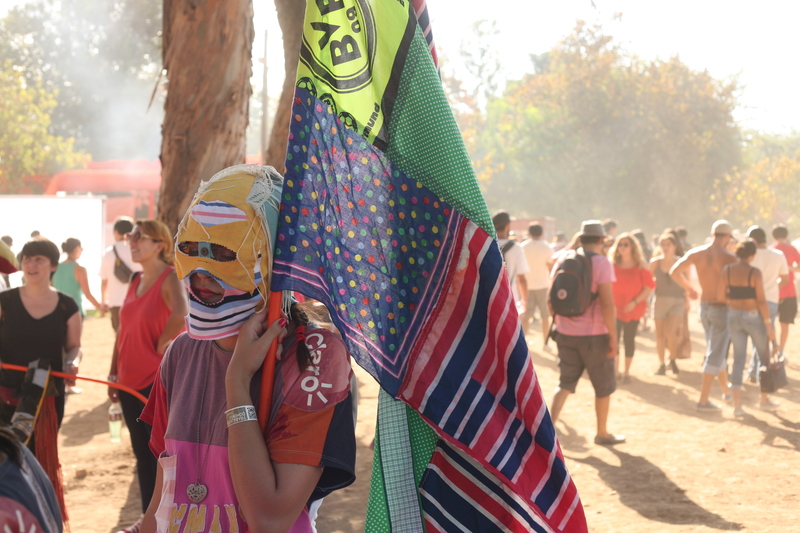 Mask-making workshop at Lollapalooza, Chile. ELIZABETH ORIA (EO): What is your daily creative process like? Do you begin with a drawing, a “drape”? MARIANO BRECCIA AND MECHI MARTINEZ(MB/MM): Our process always originates from the material we are using: used clothing. The material available is very important to us, as it directly affects the type of piece we develop. It limits us and also gives us the opportunity to develop a certain acuity when the time comes to leverage the resource. In this process we have two routes. 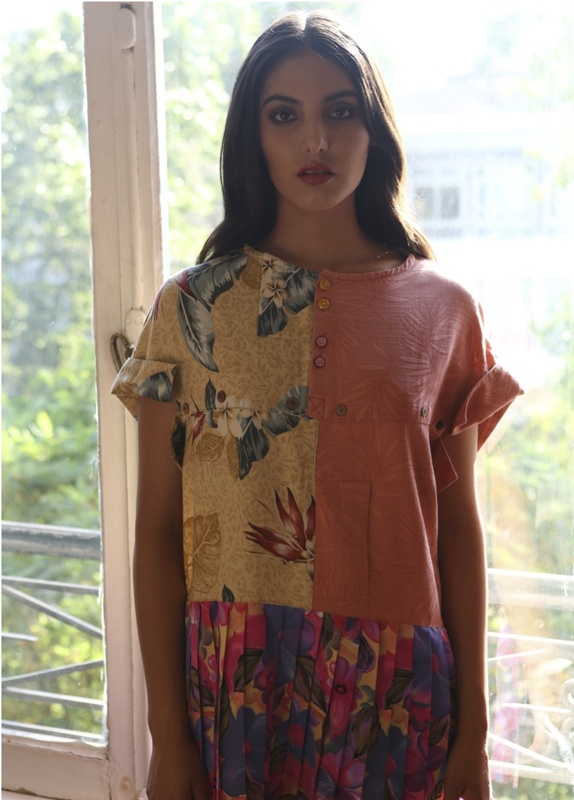 In the first, everything revolves around the deconstruction of a garment, which allows us to take full advantage of existing, ready-to-wear resources to make clothing and give it new meaning. The second route involves traditional molding: in a more conventional way, we cut a vintage piece and use the parts in combination with sometimes untraditional materials, thus creating a new piece of clothing. EO: Where does the inspiration for your creations come from? MB/MM: It comes from our environment, our roots, music, and from the materials we use, out of which we tell a story or generate a feeling. Our creative developments are very playful and free. Our design and creative work moves between the worlds of fashion and art, aiming at a customer who is respectful of his or her environment and conscious of the way consumption works today. The negotiation of that fine line between fashion and art is clearly visible in our workshops and in the research methods that give rise to the collections. EO: How do you see your own work in fashion: as work or lifestyle? MB/MM: Our work is based on a strong creative urge, and our lifestyle responds to that urge. We are in the fashion world as well as the art world. We do things with love, which is reflected in our work and in our lifestyle. EO: Why is Chile a good home base for 12-na ? EO: You refer to the Japanese consumer as respectful. What exactly do you mean by this? MB/MM: We construct highly complex pieces of clothing using sumptuous materials, some so costly that the fashion industry no longer uses them. In Japan, we find consumers who value items made the traditional way, with skill. The Japanese value the craft that goes into our products’ design and tailoring, and are willing to pay what they are worth (SEE FIGURE 3). Piece for a Japanese client. Photo: Nacho Rojas. EO: What is the philosophy and aesthetic of 12-na ? MB/MM: We like to think of 12-na as a multidisciplinary creative platform but with a very defined aesthetic perspective. Our philosophy is to use recycling as a means of expression, and from this to create through different channels. Besides clothing, we make installations, videos, textile sculptures, and life-size dolls, among other things. Our work is diverse; it is a place to unload our creativity and to promote the use of recycling as a channel of creative and personal transformation. Just as we use a t-shirt to make a mask, we also invite reflection. We are extremely attentive to what is happening. We want to do many things, and we are ambitious. Our desire is to make larger and larger things, and complex things, a desire reflected in all aspects of our work. We do not compete with the big fashion conglomerates: our work is something different, with different results—namely unique, one-of-a-kind pieces. The basis of our work is not the insane production of money; it is a project that meets a creative need. We work hard to provide clothes that are understood as products made in a sustainable way. Our pieces have an added value that classifies our work in the craft rather than the industrial category (SEE FIGURE 4). From the Free Guilli Collection. EO: How is it possible to interpose the system of fashion with a practice like yours? MB/MM: We don’t think very much about fashion, or style. At the moment of making, we don’t have our sights on leaders of the fashion circuit. Our material, used clothing, gives us another world in which to work. We are in the middle: we make clothing, but more than interposing a system, we interpose the consumer. We believe in responsible consumption and in working from there. It is impossible otherwise. EO: What advice would you give to young designers looking for an alternative route within fashion? MB/MM: To implement recycling, relating to the environment and understanding their place in it, while still enjoying their profession. To produce while having a good time. EO: To close, a dream: what sort of fashion would you like never to see again?